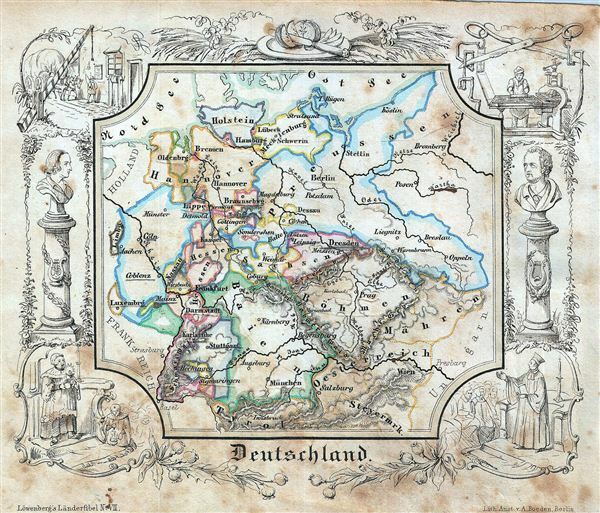 A delightfully whimsical 1846 map of Germany, from a German kinderatlas or children's atlas. The map details Germany from Holstein to Salzburg with divisions shown by color coding. The whole is surrounded by a wide border featuring charming vignettes meant to illustrate the peoples and cultures of the region. These include busts of two Germans, a bishop giving a sermon, a woman holding a candle with a man kneeling next to her, etc. The map is accompanied by its adjacent page, which includes a poetic history of Germany in German gothic type. The wonderful and rare map was drawn by Anst. V A. Boeden of Berlin for inclusion as plate no. VII in the 1846 issue of Julius Loewenberg's Geographische Landerfibel. Average. Overall toning with foxing overall. Blank on verso.